Deutsche Welle Kotau vor China? Der Deutsche Journalisten-Verband hat den Intendanten der Deutschen Welle Peter Limbourg aufgefordert, China-kritische Stimmen im deutschen Auslandssender zu unterstützen und nicht zu behindern. Auch unter der neuen Redaktionsleitung müsse die innere Redaktionsfreiheit gewahrt werden, forderte DJV-Bundesvorsitzender Michael Konken: „Politische Themen, zu denen selbstverständlich auch die Kritik an Menschenrechtsverletzungen gehört, müssen weiterhin einen angemessenen Anteil am Programmauftritt der Deutschen Welle haben." Eine „weichgespülte" China-Berichterstattung mit dem Ziel, Zugang in einen zensierten Markt zu erhalten, könne für den deutschen Auslandsrundfunk keine vernünftige Option darstellen. Von Intendant Limbourg erwartet der DJV, dass er auch künftig den Markenkern der Deutschen Welle als einem staatsunabhängigen, öffentlich-rechtlichen Sender bewahrt, der kritisch-distanziert über autoritäre Regime jeglicher Art berichtet. Die von Limbourg angekündigten Kooperationen mit chinesischen Staatssendern und die Beendigung der Tätigkeit einer China-kritischen Autorin durch die Deutsche Welle würden dem deutschen Auslandssender mehr schaden als nützen. „Ein Kotau vor den Mächtigen in Peking vertrüge sich nicht mit dem Ansehen des Senders als Stimme der Freiheit", sagte der DJV-Vorsitzende. The German Association of Journalists has the director of Deutsche Welle Peter Limbourg asked to support China-critical voices in the German international broadcaster and not to hinder. Also under the new editorial line must the internal editorial freedom are respected, called DYL National Chairman Michael Konken: "Political Issues, which of course includes the criticism of human rights violations, must continue to have an equitable share of program performance by Deutsche Welle." A "soft-focus" China-reporting with the aim of gaining access to a censored market, can not constitute a reasonable option for the German international broadcaster. From the Artistic Director Limbourg DJV expected to continue to preserve the core brand of Deutsche Welle as a state independent public broadcaster, the reported critical-distances over authoritarian regime of any kind. The measures announced by Limbourg cooperation with Chinese state broadcasters and the termination of employment of a China-critical author by the German wave would harm the German international broadcaster than good. "A kowtow to the powers that be in Beijing not vertrüge with the reputation of the sender as the voice of freedom," said the DJV-chairman. My husband Gao Zhisheng is a Chinese lawyer, safeguarding the interests of vulnerable groups, and providing free legal services to the poor. With his legal professionalism, Gao Zhisheng stands upright to educate the general public and disseminate the concept of justice and human rights. His own skills and knowledge of the law, and eloquence for justice on the court for the victims, thus won him a high reputation and respect, and public supports in China. Over the past 8 years of painful memory, I had to repeatedly in the media recall and describe these unbearable, sadden memories and experiences about him and my family. Now, these worries turn into a terrible reality. On August 7th, Gao Zhisheng finally got released. But, since then his home has turned into another prison. Each and every day, the public security "visits" him twice, one group in the morning and the other group in the afternoon. Every forced visit lasts for more than two hours and they do not leave. The family and members are unable to live with ease nor function properly. 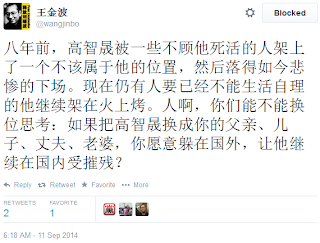 The frustrated Gao Zhisheng even told the police: "You force to visit me every day and claim it to be your job. I and my family members could not even rest; why don't you take me back to jail!." Now, I can get through his phone line and talk. He is recovering and learning to speak. His talks go on and off, with noise interferences, and many times needing a family member to help explain/interpret. I tried every possible way to map out his current situation and to grasp the sadden details he suffered in the past, including the 20-month "missing" before he was reported to be jailed at Shaya prison (沙雅监狱). The truths I learned make me no choice, but to disclose them to different Governments, Parliaments, mass media, and concerned individuals about Gao Zhisheng, and to seek for your helps. When Gao was released from prison, he weighted 137 lbs. With his height being 5 feet 10 inches, he weighed about 175 pounds before. He was crippled, walking one foot high and one foot low, with the whole body swinging like polio patient. His face was as pale as a ghost; he murmurs and could not speak clearly. He reacted slow or non-responsive. He had a total of 28 teeth (all good teeth, 12 at the bottom and 16 at the top). He has now only 14 good teeth all together, with 12 teeth very loose including 6 front teeth, easily pulled out by hand. He lost the two teeth of upper right in the back somewhere in the prison, making the adjacent one extremely loose. The 5 teeth of upper left are also very loose, which can be unplugged easily by hand. Whenever he lies down, the 12 loose teeth are also lying down on his tongue. Whenever he shakes his head, his teeth chime in his mouth. Since the nerves of these teeth are all exposed, he suffered with constant toothache every day. He can thereby only eat baby food. In the past 5 years, he was put in a dark, enclosed cell ward with daily meal of only one steam bun and a bowl of boiled cabbage. He couldn't eat bun normally, rather break it off into small pieces and hand-feed to the right place of his mouth. The cell ward is only 70 square feet big, with no windows, no opening, no ventilation, and no sunlight. It takes only two steps before he bumps his face to the cell wall. He was confined in this tiny space for 5 years and was never allowed to go outside. Gao Zhisheng is now in a very alarmingly poor health: severely lack of nutrition, low in blood sugar, with a small cyst on the gall bladder. Particularly after staying in a dark cell ward alone for 5 years, he has lost part of his language skills. According to my sister: He needs 2 to 3 years of traditional Chinese medicine treatment, and his language skills may be recovered in a year. Nevertheless, he still said to us: "While I was jailed inside for 5 years, the whole family suffered fears and harassments that were no less than mine. I feel very sorry and guilty to the family." He said he wants very much to reunite with his family, and his body needs to get recovered. He is very willing to come to the US for dental treatment. But, he also said that while in the prison, the police had told him that "Going to the United States is nothing but a dream, especially if the U.S. Government wants you to go!" Please allow me to recall what Gao Zhisheng had gone through in that 5 years, the so-called "probation period" from December 2006 to December 2011, before he was thrown into Shaya prison., More than 6 times, Gao Zhisheng, was forced "disappearance", the longest one missing over 20 months (from April 2010 to December 2011). Now I learned that 20 months, he was detained in a basement of a secret military base. Gao previously described the tortures he suffered from his earlier disappearance in his July 2007 article, "Black Night, Black Hood, Black Gangsters' Kidnapping". People may find the tortured in there very cruel and already beyond anyone's imagination. But the tortures he suffered during that missing 20 months are way over that of July 2007. One example of it during the winter seasons, is that the military basement had no heat and he was allowed to wear only summer clothes. My husband relied on counting the numbers to resist winter cold and struggled from daylight to night time, day after day, and week after week. Born in north, he was never afraid of winter cold, but now he gets frightened facing the cold. This is the persecution of a country onto an individual, where I am powerless to change anything. I can only continue to urge the media to cover his news and help speak up his needs. I also need urgently the United States Government, to speak out loud the voice of justice on behalf of the international community, and to provide actual helps to my husband, attorney Gao Zhisheng. 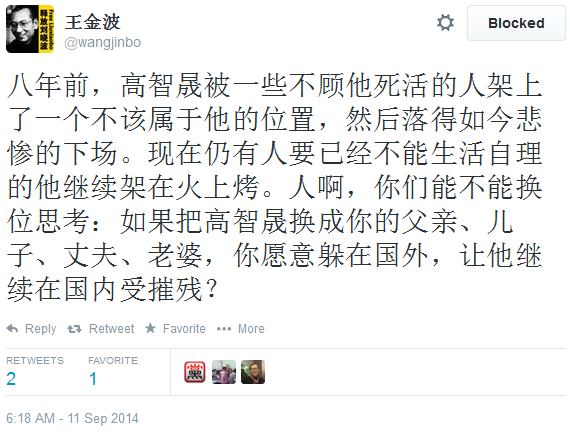 The persecution of Gao Zhisheng is nothing of personal enmity with the ruling elites of the Chinese Communist regime. It is the evil CCP's fear of the righteousness of attorney Gao. However, with legal helps of his many individual cases, he could not, after all, change the whole rule-of-law system in China, but brought him the attentions and threats from the authorities. Ever since 2005, he began to take up cases of persecuted Christians, Falun Gong practitioners, and other victimized groups, Gao Zhisheng has undergone a fundamental change in his relation with the CCP authorities. CCP Government publicly suppressed and persecuted him: shutting down his law firm and revoking his legal license. In August 2006, the police illegally kidnapped him. On December 22, 2006, Chinese authorities sentenced him with "inciting subversion of state power to 3 years of imprisonment, and 5 years of probation. Just only 4 days before ending of his probation, the CCP foreign Xinhua News Agency reported: "Gao Zhisheng next 3 years will be in prison." And at the end of 2011, lawyer Gao Zhisheng was secretly transferred to the far remote Shaya prison in Xinjiang Aksu Prefecture. During this past long period, the family was only allowed to visit him twice for 30 minutes. In fact, it was only 15 minutes, prison visiting hours, which was strongly protested by Gao Zhisheng. As for, the tremendous psychological trauma caused by the CCP on me and my children, our horrible journey on the road of escaping China, and the initial difficulties experienced in the United States, they are now negligible, when compared with Gao Zhisheng's enduring. Being an internationally and nationally renowned, high profile lawyer, Gao Zhisheng's story showcases the widespread persecution of Chinese people and China's deteriorating human rights situation. So, today I stand before you here, with an ardent hope that President Obama and Secretary of State Kerry can publicly express concerns about Gao Zhisheng. This is the most direct, prudent way the United States supporting human rights of Chinese people. Your voice will not only give the light, encouragement, and inspiration to Gao Zhisheng, and to the long-deserved Chinese people for freedom and human rights. Gao Zhisheng and our family are in an urgent need, from humanitarian viewpoint, to get helps to the United States for dental and health treatment. My heartfelt appreciation to you all! Thank you!